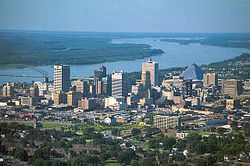 Spending the weekend in Memphis, Tennessee a city rich in culture and more than enough options for entertaining yourself! Memphis is prideful of its music, sports, food, and overall southern spirit, which embraces you once, you embark upon its picturesque downtown streets. A vibrant city that lies in the Southwest corner of the state literally only miles from Arkansas to the West and Mississippi to the South! Each visit I have made to Memphis has been for a different purpose but the city is so diverse that it makes a great home base for any event or cause! Memphis is also very rich in history and has been a landmark location for the civil rights movement, from the sanitation workers strike in the 60’s to the assassination of Dr. Martin Luther King Jr. This beautiful city that lies on the Mississippi River is one of Americas finest and a sure bet to entertain, enrich, and comfort you during your next visit! This entry was posted in Education, Travel and tagged Arkansas, Civil rights movement, Culture, food, Martin Luther King, Memphis, Memphis Tennessee, mississippi, Mississippi River, music, Sports, Tennessee. Bookmark the permalink.